Blending is used to make transparent objects. When graphics are rendered, after all Shaders have executed and all Textures have been applied, the pixels are written to the screen. How they are combined with what is already there is controlled by the Blend command. Blend SrcFactor DstFactor: Configure and enable blending. The generated color is multiplied by the SrcFactor. The color already on screen is multiplied by DstFactor and the two are added together. Blend SrcFactor DstFactor, SrcFactorA DstFactorA: Same as above, but use different factors for blending the alpha channel. BlendOp Op: Instead of adding blended colors together, carry out a different operation on them. BlendOp OpColor, OpAlpha: Same as above, but use different blend operation for color (RGB) and alpha (A) channels. AlphaToMask On: Turns on alpha-to-coverage. When MSAA is used, alpha-to-coverage modifies multisample coverage mask proportionally to the pixel Shader result alpha value. This is typically used for less aliased outlines than regular alpha test; useful for vegetation and other alpha-tested Shaders. Add Add source and destination together. Sub Subtract destination from source. RevSub Subtract source from destination. Min Use the smaller of source and destination. Max Use the larger of source and destination. LogicalClear Logical operation: Clear (0) DX11.1 only. LogicalSet Logical operation: Set (1) DX11.1 only. LogicalCopy Logical operation: Copy (s) DX11.1 only. LogicalCopyInverted Logical operation: Copy inverted (!s) DX11.1 only. LogicalNoop Logical operation: Noop (d) DX11.1 only. LogicalInvert Logical operation: Invert (!d) DX11.1 only. LogicalAnd Logical operation: And (s & d) DX11.1 only. LogicalNand Logical operation: Nand ! (s & d) DX11.1 only. LogicalXor Logical operation: Xor (s ^ d) DX11.1 only. LogicalEquiv Logical operation: Equivalence ! (s ^ d) DX11.1 only. LogicalAndReverse Logical operation: Reverse And (s & !d) DX11.1 only. LogicalAndInverted Logical operation: Inverted And (!s & d) DX11.1 only. All following properties are valid for both SrcFactor & DstFactor in the Blend command. Source refers to the calculated color, Destination is the color already on the screen. The blend factors are ignored if BlendOp is using logical operations. One The value of one - use this to let either the source or the destination color come through fully. Zero The value zero - use this to remove either the source or the destination values. SrcColor The value of this stage is multiplied by the source color value. SrcAlpha The value of this stage is multiplied by the source alpha value. DstColor The value of this stage is multiplied by frame buffer source color value. DstAlpha The value of this stage is multiplied by frame buffer source alpha value. OneMinusSrcColor The value of this stage is multiplied by (1 - source color). OneMinusSrcAlpha The value of this stage is multiplied by (1 - source alpha). OneMinusDstColor The value of this stage is multiplied by (1 - destination color). OneMinusDstAlpha The value of this stage is multiplied by (1 - destination alpha). This often means that objects have to be considered as “semitransparent”, and thus can’t use some of the rendering features (for example: deferred shading, can’t receive shadows). Concave or overlapping alpha-blended objects often also have draw ordering issues. By using clip() HLSL instruction in the pixel Shader, a pixel can be “discarded” or not based on some criteria. This means that object can still be considered as fully opaque, and has no draw ordering issues. However, this means that all pixels are fully opaque or transparent, leading to aliasing (“jaggies”). When using multisample anti-aliasing (MSAA, see QualitySettings), it is possible to improve the alpha testing approach by using alpha-to-coverage GPU functionality. This improves edge appearance, depending on the MSAA level used. 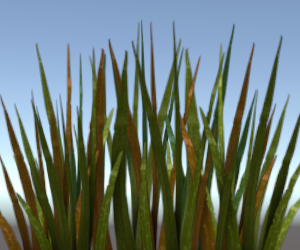 This functionality works best on texures that are mostly opaque or transparent, and have very thin “partially transparent” areas (grass, leaves and similar).